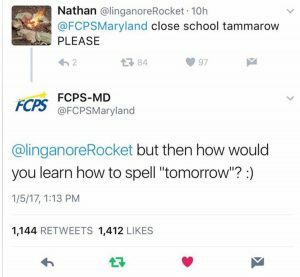 In a widely criticized move, Frederick County Public Schools controversially fired its social media manager, Katie Nash, for an innocent Tweet that lightly poked fun at a student’s misspelling. Nash, 34, of Frederick, was fired from FCPS without warning on Friday, January 13, 2016. Since her firing last week, community backlash has grown against Frederick County Public Schools, including a student-created petition directed at school Superintendant Dr. Theresa Alban to rehire Nash in her previous role. Nash’s firing has gone viral, being picked up even by international news wires. A Miner Detail’s Eric Beasley and Ryan Miner interviewed Katie Nash on their weekly online Maryland-based radio show on Sunday, January 15. Listen to “An exclusive interview with Katie Nash” on Spreaker.